The Mimic Octopus has an average size of around 2 feet in length and its natural body color is beige to brown in color, however this creature is capable of imitating a host of other creatures. The Mimic Octopus is not poisonous but will display stripes of other poisonous creatures to discourage potential predators. 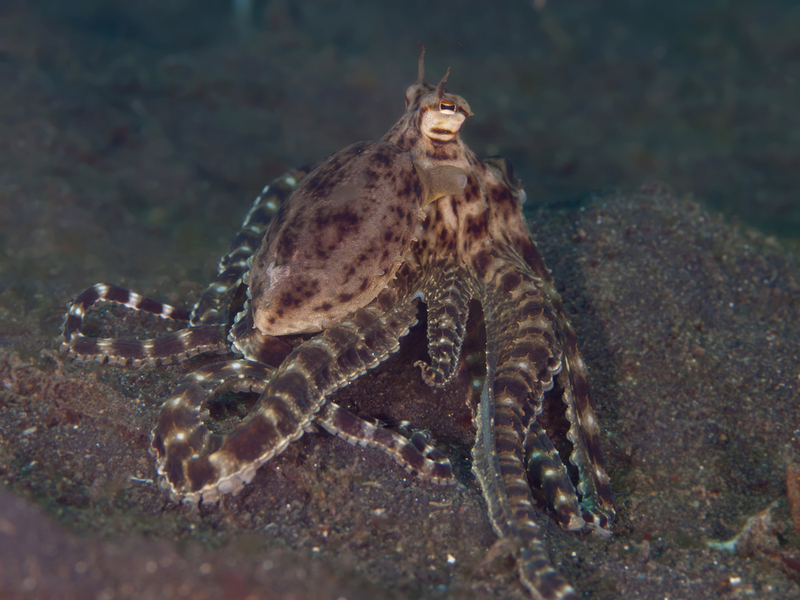 The Mimic Octopus can be very difficult to acclimate into a new environment. The Octopus is sensitive to high levels of nitrates and copper-based medications and strong lighting. Have plenty of secured live rock in the tank and seal all openings. Octopuses feed on many crustaceans. Feed a variety of meaty foods including shrimp, clam and scallop meat. For added nutrition soak frozen meaty foods in vitamin supplements.